Hostiles: Christian Bale breaks out his thousand-yard stare for Scott Cooper’s story about killing and what it does to a man. In Hostiles, director and cowriter Scott Cooper re-teams with his Out of the Furnace star Christian Bale to tell the story of Captain Joseph J. Blocker, a man of war facing a violent transition — physically and otherwise — to peacetime living. 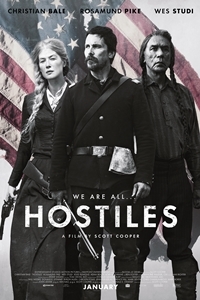 After a lifetime spent killing because those were his orders, he is ordered to preserve the life of his bitterest enemy, an ailing Cheyenne who wants to die on his home turf and needs protection for the journey. To complicate matters, the caravan picks up a pioneer woman (Rosamund Pike) who has just endured the slaughter of her family by the natives. Bale nails the portrayal of Blocker’s cold hatred, honed by experience, bound by a strict code, and tempered — perhaps in both senses — by a fierce intelligence. Throughout, a great deal is communicated even as very little is said. By turns deliberative and chaotic, brutal and merciful, definitely bleak and just maybe hopeful. Matthew Lickona: You made Out of the Furnace with director and cowriter Scott Cooper in 2013, and now you’re working with him again. What do you like about it? Christian Bale: He’s very open to my ideas. We start long before filming, right from the get-go, through every single scene. It seems to work well. ML: In particular, I’m guessing, in the development of your character, Captain Blocker. CB: Captain Blocker is a man of few words who is very comfortable with few words. I liked very much that through the whole story, you really learned about Blocker through the characters around him. He’s fascinated by Rosalie, who is as incredibly damaged as he is, but who is far freer in expressing it. He hates the Cheyenne warrior Yellow Hawk because he’s seen his brothers in arms killed by him. But he also has respect for him, because he knows he would behave exactly the same way. And he recognizes that Yellow Hawk has a family, has substance, and that without Yellow Hawk, he himself doesn’t have any purpose. He’s defined by his enemy. ML: Okay, let’s talk about a couple of the other characters around Blocker. In the opening scene, Master Sergeant Metz says to Blocker, “I got the melancholy,” and Blocker replies, “There’s no such thing.” What does he make of his friend Metz, then? CB: He’s been through what Metz has been through. He’s seen his men go through the same thing. He knows it exists. But as the captain, he says that it does not exist. And he makes a huge statement about that when Metz says, “They took my guns,” and then on the parade ground, Blocker hands him his guns back. That was something I brought in; I was making a film in late 2004, early 2005, and I was reading the Army Times quite a lot. I was pleasantly surprised: they were talking about PTSD and military suicides far more than the conventional media. And I went down and met with a Marine recon team at Camp Pendleton — those guys are out in front of everybody — and I mentioned PTSD, and they said, “There’s no such thing.” What I found was that when you spoke with them as a group, they said it didn’t exist, because they do not want to be the one who shows vulnerability that then becomes infectious. But when you spoke with them one-on-one, they said, “Yes, it’s there, but I don’t want to talk about it, because I need to hold it together.” I relayed that to Scott. ML: Later, he has Sergeant Wills tied to a tree, held prisoner for murder. Wills says that it could as easily be Blocker tied to the tree, and Blocker counters that he was just doing his job. Does he believe that somehow absolves him? CB: No. He knows that Wills was a good soldier. It was just a matter of time and place. That stems from a conversation I had with Scott about my namesake, a Private Bales in Afghanistan. He left his post and went out and massacred an Afghan family. That’s why Wills brings up Wounded Knee, where there were massacres of women and children. Blocker was involved with that, and he would understand that the guilt would be equal. There are some fascinating letters from generals who were involved with Wounded Knee and who have objections about it. So the film is a journey in an attempt to see if he can have any sort of usefulness outside of killing. ML: One of the places where Blocker does seem to let himself show is in his attention to, and discussion of, religious faith. He studies Scripture and professes belief but can’t imagine God having much to do with the world. CB: We discussed that a great deal as well. I don’t think it’s in the film, but there was a scene where it came out that Blocker, after the Civil War, wished to become a theology student. But by this point, while he doesn’t want to let go of the possibility of faith, because it holds a hope for something better and a hope for the friends who he has lost, he hasn’t seen evidence of it through his years of witnessing death. Whereas Rosalie is absolutely holding on to her faith, because otherwise, she sees no reason to go on living. When he speaks to her, there’s the desire to be honest, but also the recognition of how much it means to her. He doesn’t want to destroy that belief, even though it’s been eroded in him. ML: The film begins on an almost cruel note, with notice being served that your guiding principles - the things you sacrificed for - are subject to change without notice. CB: Blocker is a bigot who is filled to the brim with hatred - an incredibly unhealthy character. But I think what's even more unhealthy - and we witness the frustration in Blocker brought on by this - are the political whims by which it's suddenly decided that [those in authority] need a PR stunt, and so Blocker has to do a 180. The guilt that comes in rendering your brother-in-arms' deaths meaningless by giving up the hatred. Mentally, it's a fascinating journey, and it's also a very raw, very visceral, harsh, violent story. And so is America's story. That all combined for me to say to myself, "Yeah, I can be obsessed with this story." ML: Can we talk about the end of that journey? I have a note here: "The essential condition of man is war, so what is he supposed to do in peacetime?" CB: He doesn't know what to do in peacetime. He's standing on the train platform, and he's gone from the absolutely essential presence to keep everybody alive to being in peacetime and having no kinship that he can feel with any of the other people on that platform. Scott and I discussed what Blocker should do at length, and I'm really happy with what we did. It's in Scott's wheelhouse, because in no way is it a neatly wrapped-up ending. It gives us hope for these damaged individuals, but it's not an unrealistic hope. It's a hope where you recognize that this might not work, that they have been through too much.